After re-learning the art of crochet, collecting my old stash of yarn from mums, and discovering a large selection of blue yarn within it, I knew exactly what to do. Find a pattern for some cute baby item, expand my repertoire, and make something for my friend Maria who is expecting twin boys. 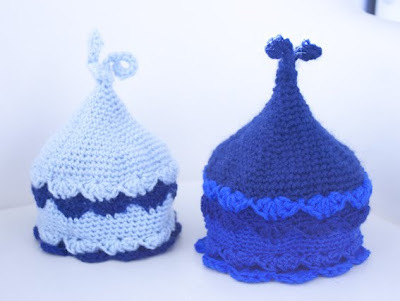 My crochet book only had one baby item in it – this very cute 'who' inspired hat! The stripy design made it perfect for using up my oddments of yarn. I made the light blue one first which was an exercise in what not to do. After I learnt from those mistakes, and produced a much less lumpy looking second one, I unpicked the first one and did it again. It looks a lot better second time around!